"Psst! Want to find some great puppy names?" Hello and welcome to Puppy Names HQ. If you you're reading this you've probably just brought home a new puppy or dog, so congratulations! Giving a loving home to a dog is one of life's great joys. It's an exciting, busy time for all concerned, what with all the oohing and aahing over the little guy or gal, puppy shopping, and the less desirable aspects, like picking up puppy poop. There's also the important issue of choosing a name. Now, name choosing can sometimes be a breeze and at other times can be a really frustrating chore. It needn't be! If its names for dogs you're after we'd like to help. On this site you'll find thousands of great puppy names - all sorted and sifted in ways that make choosing quick, easy, and a whole lot of fun. So visit with us a while, have some fun, nose around and bring back the perfect puppy name. Click on any of the links below to get started with your search. Happy hunting! 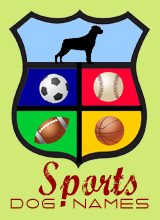 A good place to start your search, with thousands of quality names for dogs both great and small. From Azalea to Zebulon, from Zero to Hero, from Alpha to Omega, and they're all right here. Need a name for a specific breed? Our Dog Names by Breed pages list many popular breeds and reference breed traits and temperament, famous dogs, and country of origin. Whether you want to choose names from your dog's country of origin or celebrate your own ancestry, these pages will take you to an extensive collection of names for dogs by national origin. 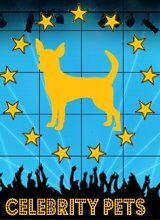 Choose with confidence from hundreds of quality puppy names from different cultures around the world. Our famous and celebrity dog names pages feature dogs who are either famous in their own right or have somebody famous for a best friend - including dog heroes, movie star dogs, canine characters, celebrity pets and the dogs of former Presidents. Puppies are just about the cutest things on earth and our selection of cute puppy names has names so sweet they'll make your teeth ache. 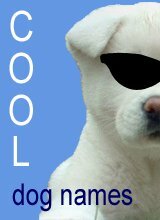 We've plundered categories like music, movies and fashion to find the coolest dog names on the planet and ensure that your dog never has to be embarrassed by an uncool name. Follow this link to some of the most interesting, creative, unusual, exotic, weird, and dare we say, unique names on the web. From mythology to foreign names to unusual names for dogs from movies, music and literature - this page is a great resource for dog names that are just slightly left of center. Search the site with the Google box below or visit the Site Map. 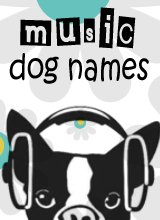 Our mega database has a list of dog names second to none. With thousands of quality names - and our unique themed pages to help you on your way - finding the great name your dog deserves is a breeze. Our mega database has a list of boy puppy names second to none. Thousands of quality names and our unique themed pages make finding a great dog name quick and easy. Looking for interesting dog names and meanings? Our mega database has thousands of quality names from all over the world. From Chinese to Celtic to Native American - you'll find them all here. Our database lists all of the most popular dog names from around the world. From the US to Australia, Canada to the UK, you will find them all here. Choosing favorites is never easy, especially when there'€s a mega database to choose from. Nevertheless, we've given it a go. Here are the Favorite Puppy Names from Puppy Names HQ. Our mega database has a list of Celebrity Dog Names and famous dog names second to none. From celebrity pets to canine movie stars to canine characters and President's dogs. 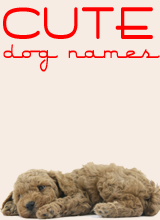 You'll find the cutest of cute dog names at Puppy Names HQ. Our mega database has 1000s of quality dog names and 100s of themed pages designed to make your search quick, easy and fun. Looking for Unique Dog Names to suit your unique dog? Our mega database makes it easy to be original with 1000s of unique names. 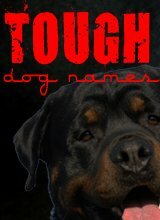 Looking for Unusual Dog Names to suit your unique dog? Our mega database makes it easy to be original with 1000s of unique names. You'll find only the Best Dog Names at Puppy Names HQ. Our mega database has 1000s of quality dog names and 100s of themed pages designed to make your search quick, easy, and fun. FACT: Choosing the wrong name can cause dog behavior problems. Avoid any problems with these easy tips for naming dogs. The Puppy Names Blog keeps you up-dated with all additions and changes to puppy-names-hq.com, the web's best resource for unique and original dog names. Search puppy-names-hq.com. for the best puppy names on the web. This special Hero Dog Names List honors some very special dogs - from heroic war dogs to amazing assistance dogs to the wonderful search and rescue dogs of 9/11 and other disasters.